Point Prim peninsula is surrounded by surprisingly warm water. Perfect for sea bathing at high tide ... low tides reveal miles of seashore. Delightful for beach combing, clam digging and bird watching You can see sunrise AND sunset from our beach! Bring your camera! Constructed in 2005, Heron Cove was designed for gracious living. A large comfortable home with 3 bedrooms, 3 bathrooms and a 2nd floor game and family room for extra stretch out space. There is an oversized country kitchen, family room, library and sunroom. The roomy screened in porch doubles the size of the kitchen, ideal for seaside meals. over sized dining table could seat 8 friendly companions. The Northumberland Strait is a warm and gentle ocean very suited to safety. Heron Cove beach house is within 100 feet of the shorefront and easily accessible by foot. Artist owner may reside, occasionally, in the summer studio cottage. Herbs and spices are grown on the deck garden, for your delight and the grounds are maintained for your pleasure. A lovely place to spend family time! We had a lovely family time at the Heron Cove cottage. The view of the ocean from the house is beautiful and serene. The house itself is spotless clean, cozy yet tidy. It is also surprisingly spacious, much more than you could see from the photos. The second floor has a very large living area on its own in addition to the bedrooms. The house, particularly the kitchen, is so abundantly stocked. A 5-10 minutes of drive to the local convenient store, you will find very friendly owners and your basic supplies. Finally, our host Linda is very responsive to all of my questions with full honesty and respectful to our needs. It is certainly a great place to spend family time together! This beautiful home, overlooking the water, is a very short walk to the beach. This newer home is well designed and maintained. The owner was the best all-round owner we have ever had the good fortune to work with. This spotlessly clean home was stocked with everything you could need or want. Even items I had inquired about in advance (cooler, hair dryer, lobster pots) were waiting for us. This home is like your own art gallery. The owner, an artist herself, has adorned the home with art of diverse mediums. There are shelves and shelves of fiction and non fiction books. If you are looking for serenity, this is the place for you. We look forward to our return. A wonderful week in Heron Cove! We just enjoyed a wonderful week at Heron Cove. The views from the house were spectacular and the beach is just a few steps from the door. Linda, the owner, made our stay special from booking a table at the Point Prim Chowder house (don't miss it) and baking a pound cake for our arrival. Our kids enjoyed finding hermit crabs on the beach and collecting clams at low tide. If you go, catch the Wed. harness racing at Pinette Track a few kilometers from the house. A lovely vacation home, perfect beachside getaway. Heron Cove was the perfect place for my sister and me to spend the week together. On arrival we were welcomed by a homemade cranberry loaf on the counter and a friendly welcome note. The first thing we did even before unpacking was to pour the wine and explore the house and beach. The house is even more impressive than the pictures show. Each room is decorated in a way that says comfort and style and warmth. You feel you can be relaxed and enjoy yourself in each space. There are even soft shawls beautifully draped on backs of couches so you can wrap up in them on a cool night. We made excellent use of the screened in porch for morning tea and evening drinks. The beach is very private and when the tide goes out allows for great exploring and shell searches. When we were there in June the water was warm and shallow and you could wade far out. We spent several afternoons relaxing on the sandy shore. The house is also in a perfect location for exploring the island. It's an easy trip into Charlottetown for an afternoon or evening. We also enjoyed dinner at the Prim Point Chowder House which is very busy so make sure you have reservations. We enjoyed this trip so much I tried to book another week for my self and my husband in September but it was booked. We will definitely be going to Heron Cove again. 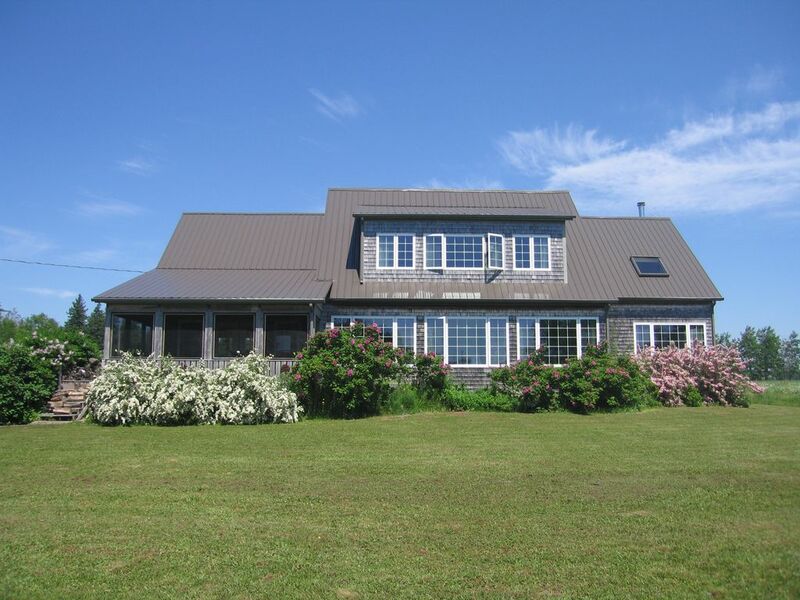 It will feel like coming home to our new found favourite place on PEI. Four of us (all adults) rented this beautiful, well appointed house on the water last August and for the first two days, the artwork and books at the house and idyllic beach kept us enthralled—we never left the property. The beds and furniture are wonderfully comfortable, the kitchen well equipped, and the walk to beach, easy. We took the beautiful coastal drive into Charlottetown, the provincial Capital, and had a terrific time—warm and friendly people everywhere. Just up the road from the house, there's a wonderful seaside restaurant called The Chowder House—if you come to Heron Cove, don't miss it—it became our "go to" place for lunch. Heron Cove is a well-loved home full of delightful surprises. We'll definitely be back! Thank you so much for having us! What can I add that has not already been said in the previous reviews? Heron Cove is as pretty as it is shown in the pictures. We joined two families and one guest from Europe in this lovely house and we felt like we had all the comforts of home if not more! The best room in the house is the screened porch; it is flooded with light both at dawn and dusk. We ate and played games there without any disturbance from pesky insects on those days where there was not enough wind to protect us from them. There is a lovely lawn where we played badminton or catch and we also enjoyed roasting marshmellows in the fire pit. My husband had decided to bring a large floatation device and I am glad he did; the water was so calm that we were able to just relax while floating a few meters from the beach. Linda is a perfectionist and her attention to detail is evident everywhere in the cottage including in the cleanliness. She is also highly responsive should you need help with anything. Lastly, I highly recommend the restaurant at Point Prim; the food is exquisite and the view is breathtaking. On your way there, you can stop at the bottle village where a man built an entire village with recycled bottles. Entrance is free although there is a collection box of donations for Halifax's Children's Hospital. We had a WONDERFUL time at Heron Cove and we all hope to return again some day!